This new service, launched today, is the culmination of extensive consultation with AccsMap users. 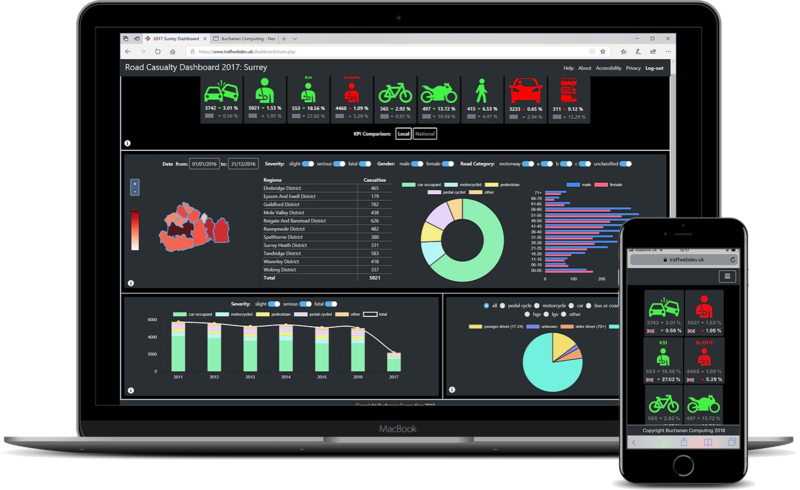 It meets their request for a casualty-based dashboard for sharing annual statitics with staff, partners and other stakeholders. It is available to all AccsMap users with current support contracts at no additional cost. Our dashboard provides an overall picture of KSI casualties for individual areas, as well as comparison to nationwide data, giving an understanding of the progress of road collision casualties from the previous year. It also allows for you to interact with the data, via a range of filters. This is just the first dashboard we are planning on providing to the road safety community to help develop a wider understanding of road collisions and to assist with their reduction.